There has been substantial FX market moves over the past month and this has led to some changes in the ranking of currencies on this framework. 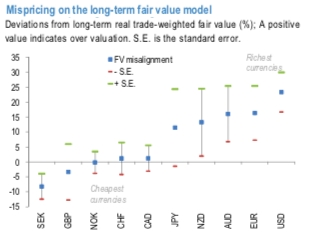 On the cheaper end of the spectrum, following SEK’s notable underperformance over this period, SEK now screens as the cheapest currency on this framework. Meanwhile, GBP outperformance over the same period has nudged the currency closer to fair value (refer 1st chart). While GBP valuations are not at an extreme yet, SEK’s undershooting is now approaching decade-lows and may indicate some limits to how much recent underperformance can extend (refer 2nd chart). The ranking is relatively unchanged on the rich end of the spectrum, with USD, EUR and the Antipodean FX still featuring on that list. Among the funding currencies, CHF is the only one near fair value, with USD the richest, followed by EUR and JPY. Yet, None of these valuations are at an extreme indicating that movement in either direction is possible. While the richness of the Antipodean FX has come off the peak, both AUD and NZD continue to look overvalued relative to the G10 petro-FX. Both NOK and CAD continue to be near fair value on this framework (refer 3rd chart). Currency Strength Index: FxWirePro's hourly CAD spot index is flashing at -81 levels (which is bearish), hourly USD is at 55 (bullish), hourly AUD spot index was at 9 (neutral) and NZD is 140 (bullish) while articulating at (09:43 GMT).